Tablets are fantastic content consumption devices and if they have a great display, then the experience is enhanced so much more. Even though tablets started out as more of content consumption devices, advancement in technology has allowed them to offer some degree of productivity, especially flagship devices like the iPad Pro, Surface Pro and of course the Galaxy Tab S series of tablets. Devices like the Surface Pro offer a full-fledged Windows experience whereas devices like the iPad try to mimic productivity through their app-based ecosystem. The Galaxy Tab S4 aims to give you the best of both worlds. It is an Android tablet that gives you everything you’d get on a Note 9 in a souped up form factor. 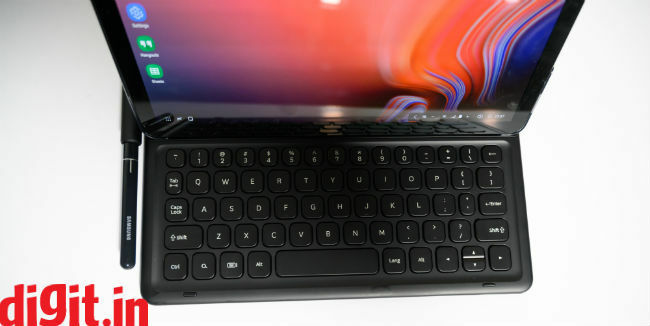 Connect the tablet to a keyboard and you get access to Samsung DeX which gives you a more desktop like experience on the tablet. If a large screen experience is what you are looking for, just connect it to a monitor. In the box you get the tablet along with a USB-C cable and a power adaptor. You also get the S-Pen in the box which is nice. Sadly, you don't get the keyboard dock in the box. It has to be purchased separately. In a day and age dominated by Snapdragon 845 devices and Apple’s A12X blowing benchmarks off the chart, it is disappointing to see the tablet run on the Snapdragon 835. Nonetheless, the tablet performed very well in everyday usage. Place the Galaxy Tab S3 and the Tab S4 side by side, and there is little difference you will notice. Both the tablets have glass on the front and back with the difference being that the Tab S4 is slightly thicker and has a slightly larger display. Speaking of the Tab S4, it is black, and since it is glass all around, it is susceptible to a lot of fingerprints and smudges. In our time with the tablet, it didn’t get any scratches but that doesn’t mean it isn’t susceptible. The 10.5-inch form factor is a tried-and-tested one (by the iPad Pro) so as far as ergonomics are concerned, you will feel right at home. When playing games or watching videos, the device is comfortable to use. Moving to port placement, (holding the tablet in portrait mode) you have the power button and volume rocker on the right, the keyboard dock connector to the left, and the headphones jack and USB-C port are at the bottom. Yes, the endangered headphones jack is here, and we are happy about that. The top and bottom of the tablet has the speaker setup (2 + 2), same as the iPad Pro and the Tab S3. The rear of the tablet has the camera in the upper third and the front has it bang in the centre. There is no physical home button or fingerprint reader on the tablet. You can set a pin or password along with face and IR unlock which is a hit or a miss. You really need to look at the tablet to unlock it. The lighting situation is key for this feature to work well. 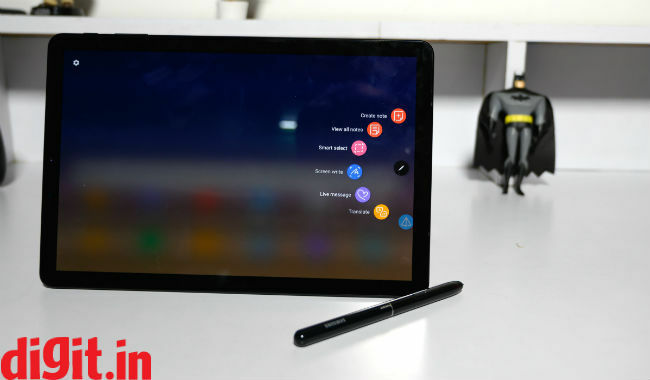 The tablet also comes with the S-Pen, but unlike Samsung’s Note family of devices or the new iPad Pro, there is no place to house the S-Pen on the Tab S4. It will be the first thing you misplace because of the lack of housing. Overall, the build of the tablet is good and premium with glass all around. The tablet is slim and without investing in a case to prop it up at an angle, typing in landscape mode is a tad annoying. The glass back may make the device feel delicate and we were careful not to drop it for obvious reasons. The size is good enough for playing games and watching videos. In fact I didn’t face any issues while watching videos on the device during a cab ride, with the tablet placed on my lap. From an ergonomic stand-point, the design is very functional, making the Tab S4 extremely usable in a variety of conditions. Calling the Tab S4’s display fantastic would be an understatement. If you are one who is going to watch a lot of movies and TV shows on the device, you are in for a treat. Add to it the fact that you can connect your favourite headphones via 3.5mm and you have a great entertainment device. We consumed a lot of content from Netflix, YouTube and Prime Videos on the tablet and all of it looked outstanding. From Spider-Man Homecoming and Wonder Woman on Prime Videos to John Wick, Star Trek and Castlevania on Netflix and a hoard of gaming videos and trailers on YouTube, this is one display that will really draw you in. The colours look rich, blacks look deep and the display is very immersive. We tried using the display under direct sunlight and it works quite well. You can also increase the brightness of the device a little more for use under direct sunlight. Apart from movies with dark sequences, the tablet was very easily usable under direct sunlight. When it comes to everyday tasks like reading emails, reading a book, playing games or browsing the Internet, the display worked without any complaints. It was reflective, but nothing that can't be taken care off by moving it around a bit. Coming to the audio, the speakers are powered by AKG, and could have been better. On their own, the speakers sound decent for watching a couple of videos. They lack bass but are quite loud. The audio is loud enough to entertain a group of people huddled around the tablet. Play the same content on the iPad Pro and you will notice the difference. The audio from the speaker of the iPad Pro is clearer and richer. For those long binge-watching sessions, I recommend a pair of headphones to immerse you. When it comes to everyday performance, like checking mail, browsing the Internet, watching videos, etc. the tablet performed impressively without any stutters. It even works very well when you use apps in split screen. The only underwhelming experience is the typing. I wish each letter had a tad more real estate in landscape mode to give users a comfortable typing experience. If you are someone who will type a lot, then investing in the keyboard accessory will be a wise decision. When it comes to gaming too, the tablet will run any game you throw at it with ease. From graphically heavy games like Asphalt to simple puzzle and shooting games, it all worked like a charm. If you are one that will use the camera, then know that it won’t replace your smartphone camera. But for Google Duo calls or skype calls, it can get the job done well. No worries. Just like the Note Phablet family from Samsung, the Tab S4 comes with a stylus. One of the coolest features of the Stylus is the ability to take notes without switching on the tablet. Just double tap the button on the pen and you can take notes on the display and then save them. The size of the display is not the limit for the length of your notes. If you’ve filled the screen, press the arrow in the bottom right corner and you have a new page to continue taking notes. The S-Pen brings with it an interesting set of features such as notes, smart select, screenwriting, live messaging, translate and more and for those of you that use these features, you will feel right at home. Personally, taking notes on the display of the tablet without unlocking it is my favourite feature. Let’s kick things off with the keyboard dock. It snaps in place behind the tablet and unlike the iPad Pro, there is no moving things around to get the backrest of the tablet right. It just fits and that is a good thing. Other good things include the layout of the keyboard, the spacing of the keys and the comfort of typing. I managed to write some of my stories on this device and the more I used it, the fewer typing mistakes I made. While all this is good, and the docking and typing experience is better than that of the iPad Pro, the device falls short when compared to the offerings of the Surface Pro. To begin with you can only prop the tablet at one angle which is a bummer and as far as use case is concerned, you will almost always need a mouse so a trackpad is sorely missed. Sticking with usability, you can switch between DeX and normal tablet mode with the tap of a button in the drop down notification. When in DeX mode, you get a desktop like experience which works but will need some polishing before it works well enough to be a viable Windows alternative. Resizing windows, multitasking, watching a video while typing a mail, all can be done. But with too many apps open, the device lags at times. Another thing to note is that resizing windows with your fingers is cumbersome and you will want to use a Bluetooth mouse or the S-Pen to get the job done. The keyboard has a housing for the S-Pen which is nice. As far as the build is concerned, the keyboard is made of hard plastic, has little flex and comes in black to compliment the tablet. It also feels as though it can withstand some abuse and offers protection for the tablet. Overall, the DeX experience is a move in the right direction for those that want a desktop like experience to be a part of their tablet, but Samsung still needs to iron out a few kinks before it can take on devices like the Surface Pro. The Samsung Galaxy Tab S4 has a 7300mAh battery. This is 1300mAh more than its predecessor – the Tab S3. In our battery benchmark with the display on full brightness, the tablet died in a mere 6 hours. However, in real world usage, it can last much longer. Playback from streaming services with brightness set to max and headphones plugged in saw a drop of 6 to 10 percent based on the streaming service. Local playback saw a 5 to 8 percent drop per hour. Drop the brightness a little (trust me, you won’t use it on full brightness all the time) and you have a device that can playback content for almost 15 hours which is impressive. The battery life will vary based on usage and some productivity scenarios may see it drain faster. Should you buy the Samsung Galaxy Tab S4? For content consumption, social media, gaming, checking mails and getting the occasional typing done, the device works fine. The glass back is a fingerprint and smudge magnet and if you drop it, the glass may break. However, as far as usability is concerned, the tablet is a treat albeit with underwhelming speakers. If you are looking for a competitor to the 10.5-inch iPad Pro, then yes, the Tab S4 stands tall. 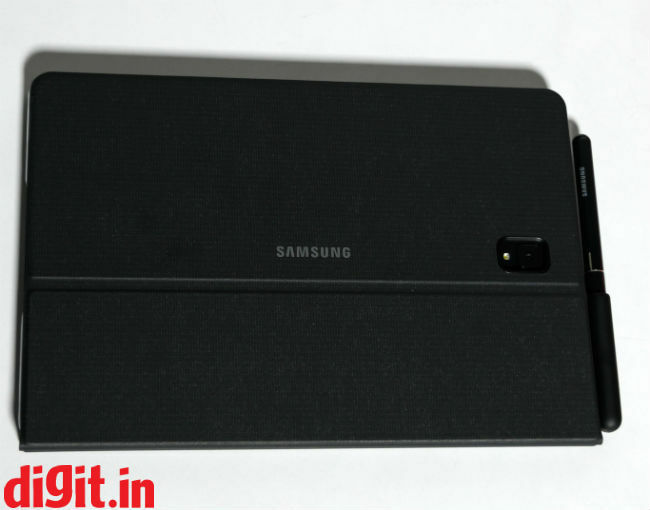 It is priced at Rs 57,900 as of writing this review. It is a good-looking device with a slim profile and has a good display for consuming content. The S-Pen has interesting functionality for those that would like to use it. The only downside is the speakers, that could have been better. If you are looking to replace your laptop with this device, I’d say you may want to think again. The productivity features work well with some hiccups. Samsung has a way to go before DeX can take on a Surface Pro. 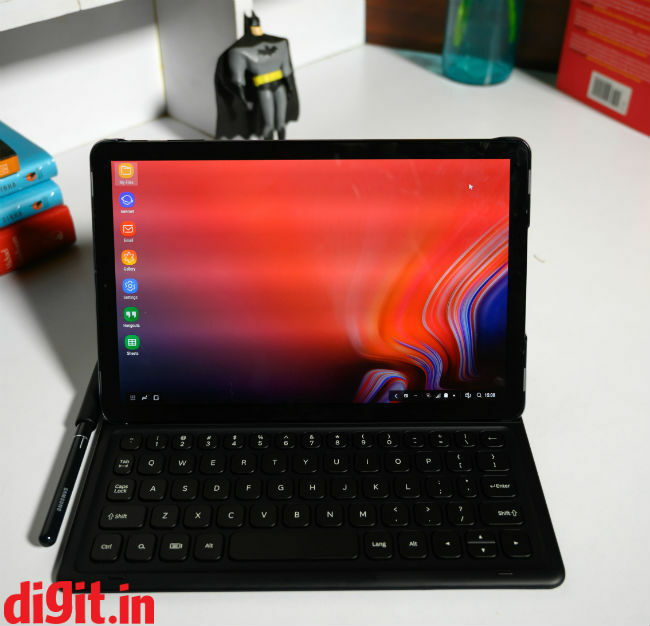 If you have the Tab S3, then you can skip this iteration of the tablet as its upgrade from the Tab S3 is minimal and doesn’t justify the upgrade unless DeX is something you are looking for. Those upgrading from an old tablet or looking for a premium tablet experience can definitely consider it. CAPACITIVE PEN FOR GALAXY S4? suggest a capacitive pen/stylus with it.